Review of the whole-house and point-of-use Seisco tankless water heaters for heating potable water in residential applications. Explore the popular models and what makes them different from other manufacturers. 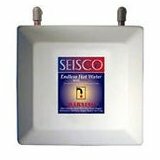 Seisco tankless water heaters are small and very efficient electric units that are designed to heat water on demand, continuously, and deliver it in endless supply. They are great as the replacement for the traditional tank-type water heaters, as a booster for the existing conventional, solar and geothermal water heating systems. Seisco RA-14 is the two-chamber water heater that is used for single applications, such as one kitchen or bath sink or shower, or as the supplement of the existing conventional tank-type water heater. There are two types of RA-14, one that requires 208 V and the other 240 V service. RA-14 is recommended for areas where the incoming water temperature is above 75 F.
Seisco RA-16 is the largest 2-chamber model designed mainly for use in small apartments and condos and where the incoming water temperature is above 70 F. As the model RA-14, it also works great when combined with the tank-type water heater or in recirculating systems. Seisco RA-18 water heater is the smallest 4-chamber tankless and electric water heater that is recommended for use in smaller homes, apartments, condos and cottages located in the warmer regions, where the temperature of the incoming ground water is above 65 F. It is used as the whole-house unit, solo or in combination with the tank type that cannot satisfy the demand for hot water. RA-24 is used in homes and light-duty commercial applications that can easily replace a tank-type water heater with the capacities from 30 to 50 gallons, and the 208 V service. RA-28 is the most popular residential tankless and electric water heater from Seisco. It is recommended as an ideal replacement of the tank-type water heaters with the capacity from 50 to 80 gallons. It is built for use in homes where the 208 V or 240 V service is required. Seisco RA-32 is the largest whole-house water heater, designed for high-demanding applications in residential and light commercial applications. It works great in the combination with the tank-type heaters to supply hot tubs and spas. Seisco tankless water heaters for point-of-use service are the great solution for heating and delivering water fast, where it is needed. These are mostly used as the under-sink units, for providing hot water to one sink and where the main whole-house water heater is distant. One of the top features found in Seisco tankless water heaters is the patented power-sharing distribution system that simultaneously provide an equal amount of heat when water is passing through the heating elements, therefore, preventing the high temperatures, scalding water and excessive mineral deposits. This way, the unit operates longer and the users are less prone to the scalding burns. Every Seisco product comes with the full-power control, so there is no disturbance in the current flow. In a case of the low demanding periods for hot water, the microprocessor reduces the power level to the minimum, so there is no waste of energy. The power level depends on the flow rate and temperature rise, and the water heater uses only as it is needed to heat the water. Safety features include dual low-level detectors that prevent dry firing of the heating elements and leak detector that sounds an alarm if there is a water leak. For the easier troubleshooting and maintenance, the water heater incorporates the microprocessor with the diagnostic software. 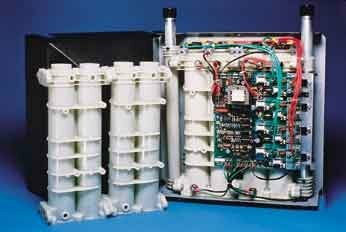 All Seisco tankless water heaters are built in two sizes and most of its parts are identical, which almost guarantees the availability of the parts. They are strong, high-performing water heaters that are made of the materials that are rust and corrosion resistant.